Today was our last full day here in San Francisco. While it has been much fun, we are tired and ready to come home. Since we did so much yesterday around the city, we really didn’t do a whole lot today. The day started with breakfast and coffee, then shipping one of our suitcases home via UPS to avoid an oversize charge. Then we took a drive over to Golden Gate Park and spent a couple of hours wandering around enjoying the weather. 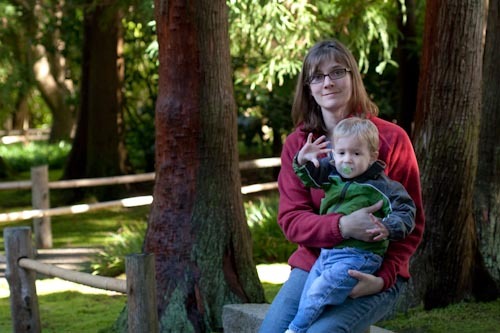 One of the stops was the the Japanese Tea Garden, but it wasn’t all that interesting. The afternoon brought a visit by our good friend David Rasch, who just flew in today for a conference. It was great chatting with him while he was here, and little David finally warmed up enough to give him an unprompted goodbye hug as he was leaving. We’ve been slowly picking things up in preparation of packing or our return trip, and once David goes to bed I’m sure we’ll make sure everything is ready to go for tomorrow morning. Direct flight to St. Louis departs at 1pm. It’ s been a great trip! I really enjoyed stopping by yesterday and had a great time! I ended up catching a bus back over here to the hotel and got some exercise too. Maybe we’ll have to meet up here again so I can try Pizza Delfina. Have a great flight back.